Until recently this sitter was considered unknown, however by comparison to another known portrait by Johnson at Canterbury’s Royal Museum & Art Gallery (fig.1), we now know it is a portrait of Colonel Robert Hammond, a Royalist cavalier, here depicted in his officer’s uniform, his breast-plate clearly on display. C. Anson, A Catalogue of Pictures and Drawings in the Collection of The Viscount Cowdray, London, 1971, p. 29, no. 86 (in the North Gallery). Hammond’s family were prominent land-owners in East Kent, with an estate in St. Albans Court, Nonington. Although they moved on the fringes of court circles at the time, with a typical annual income for parochial gentry (£254 p.a. compared with Kent peers at £4,089 p.a. ), they were clearly prosperous enough to commission portraits by Johnson. Robert was part of Sir Walter Raleigh’s second unsuccessful South American expedition to search for the fabled city of Eldorado – an expedition which ultimately resulted in Raleigh’s beheading in 1618. However, he does not appear to have suffered any punishment for his part in the failed expedition, instead entering military service. His elder brother, Francis (b. 1584), served abroad in the bloody Thirty Years War of 1618 – 1648, and it is more than likely that Robert may have done the same. 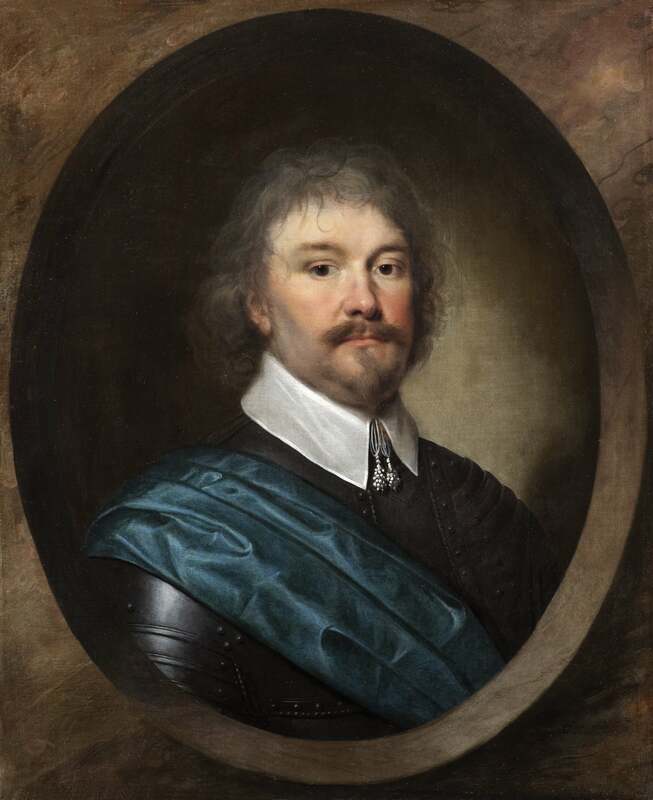 The present portrait and the one in Canterbury’s Royal Museum & Art Gallery therefore provide an important visual testament to his military background. We do know that Hammond was at the centre of Royalist plotting throughout the Interregnum. By 1648 there are records of his direct involvement in the Kentish Revolt. Later that year he took part in the defence of Colchester when it was besieged by Parliamentarian forces from July 1648 until the defeat of Royalist forces at the Battle of Preston in August. Within a year or so Robert took up duties as the Royalist governor of the castle at Gowran in Co. Kilkenny in Ireland. Cromwell began a campaign in Ireland against Royalist forces in the autumn of 1649 and by March 1650 Gowran castle was surrounded by Parliamentarian troops. Hammond refused Cromwell’s terms of surrender, forcing a siege. As a result of this, he and his officers were subsequently handed over to the Parliamentary forces and Cromwell ordered their summary execution by firing squad. We are grateful to Karen Hearn for this information, and for proposing the identification. P. Hobbs, Archaeologia Cantiana, vol, 125, 2005, p. 279. The Kentish Revolt had its origins in the Canterbury riots of Christmas 1647, when the Puritan Mayor and officials of Canterbury tried to forbid traditional Christmas celebrations. The people of Kent had petitioned Parliament, and on its rejection rose up in support of the King. The Royalist Commissioners for Kent enlisted Robert to raise a force, which he duly assembled on Barham Downs with three hundred well-equipped foot soldiers. After some success campaigning in the East Kent area against the Parliament’s supporters, his forces increased to around one thousand men. See Alan Everitt, Community of Kent and the Great Rebellion 1640 – 1660, Leicester 1966, pp. 102, 245, 249 & 268. The terms of surrender stated that ‘the Lords and Gentlemen (the officers) were all prisoners of mercy’. The people of Colchester paid £14,000 in cash to protect the town from being pillaged by the victorious Parliamentarian forces.